That’s a shame, I’ll have to see if my items get hit now (although the value is no where near Heavens Feel but still over our threshold). It would be a real shame if they’ve changed procedure and not an unfortunate one off. In all the years I’ve used them I’ve never been hit when it’s been marked as gift, even last year I had something that was 13000 yen and that got through unscathed, so I’ll be pretty bummed if they are starting to get hit. *When trying to buy from Blowitoutahere's eBay store. I got this. 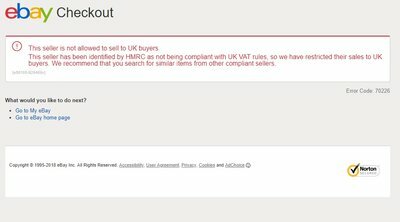 HMRC or ebay strikes again. Deepdiscount ebay store has closed too. Weird. They get closed but the sellers of malaysian bootlegs may continue? Ebay closed there accounts on the bases of them not paying there tax. Bootlegs on the other hand need to be reported. Atm its a Case of Wait and See but anyone feel like compiling a new List in a few weeks time for your friends across the Pond ? Thank you for your interest. Additional duties and taxes should not be endured but since it is an international order, we cannot guarantee this. Looks like there might be import fees. Was going to enquire about this since there's an item on their eBay store I wanted to get but not sure if it's worth the risk or not. I saw your post a while back but I couldn't remember where I saw it so I put it on here. Is there anything from them thats under £15? When it arrives, see if it has been redirected. Then you'll have your answer. Nothing I'm interested in unfortunately. The item I want is just under £40. I'll likely wait for Allyourmusic to have it in stock, or succumb to paying that 20% tax from DeepDiscount. Import CDs were customs free the last time I ordered though this was last year. Thinking of using them soon. Once it's been confirmed, I'll add it to the list. Iirc correctly they're the same as DeepDiscount so if I buy this Bleach set 4 Blu Ray then I'll let you know the results. I caved in and purchased it so I'll find out within a couple of weeks.